Aric Almirola is in the Round of 8. In a very unusual Talladega race that was dominated by Stewart-Haas Racing, an SHR car won but it wasn’t the one anybody expected. After a disappointing end last week at Dover where he had a good chance to win, Aric Almirola took advantage of teammates running out of fuel and a push by Ricky Stenhouse Jr. to win his first race since July 2014 and get himself into the Round of 8, joining Chase Elliott and Kevin Harvick, who is all but in on points, in advancing. Admittedly, most of the race was rather unwatchable. The cars of Almirola, Harvick, Kurt Busch, and Clint Bowyer pretty much dominated and it took a Herculean effort for anyone to get through that quartet. And if they had it their way, the four would have been happy staying in line until the final few turns when it would be anybody’s race. Alex Bowman got loose and crashed, which caused a fuel mileage race. Teams were good for the end of the race but once things went into Overtime, it got a bit scary. Harvick, Ryan Blaney, and Brad Keselowski had to pit late for fuel. And then came the last lap. After a final lap crash, NASCAR kept the race green. That guaranteed a race to the line and the Almirola/Stenhouse partnership really poured it on going into Turn 3. At the same time, Kurt Busch ran out of fuel after leading all day and Almirola got a huge playoff win. On the other end, Kurt Busch was not happy that NASCAR kept the race green and felt that by unnecessarily adding a lap to the previous caution and not going to caution for the final lap crash, NASCAR cost him the win. "There were two missed calls by NASCAR at the end." To many people, it’s going to come off as Busch whining but most people would have felt the same way if they were in his position. He wasn’t bitter about his teammate, he was happy that Almirola won but he still felt he was robbed. And considering NASCAR did have a lengthy caution period for some reason as well as instances where they have thrown cautions at the ends of restrictor plate races that seems inconsistent, Kurt’s comments at least have some merit and no one should blame him for reacting like that. Having said that, NASCAR may have once veered on the side of caution and prematurely ended races but they have been on the record as wanting to try to keep it green if at all possible. Also, even if NASCAR threw the caution at the end, there’s no guarantee Busch is able to come around and win. He would have been able to coast and maybe could maintain speed but he needed to go another mile at least and I had my doubts he would have been able to stay in the lead under caution. There’s no doubt Almirola has had his best season but even though this is his best season, he has had a lot of heartache. 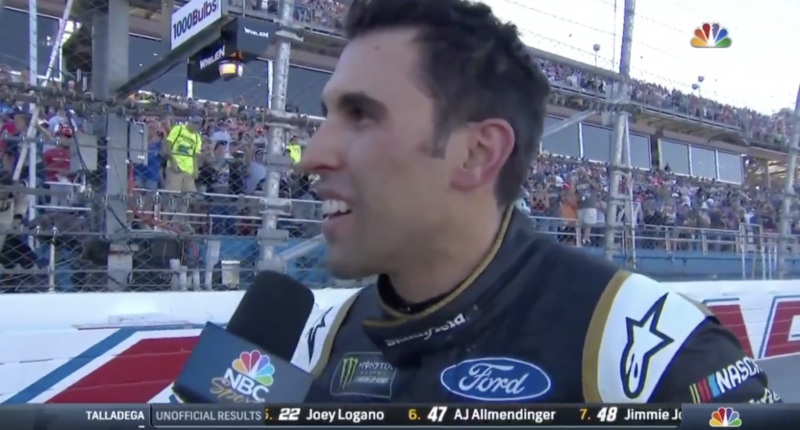 From getting wrecked while leading with a half lap to go in the Daytona 500 to his crash last week at Dover, Almirola had been feeling left out of the Stewart-Haas win party. But patience and facing adversity surely paid off as Almirola got rewarded. As someone who many view as a dark horse, who hadn’t won in the regular season, Aric Almirola is now in the Round of 8. It’s still going to be tough but given the team he’s on and the momentum he has right now, Almirola may not be finished.